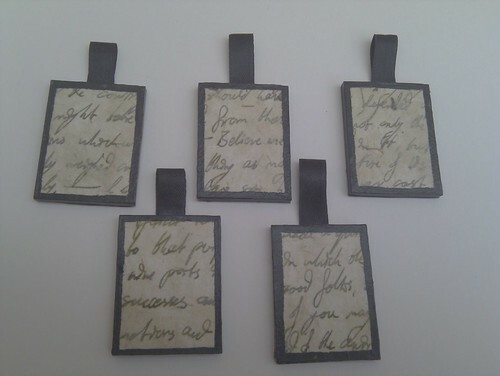 This is the latest permutation of my text jewellery – it’s made not from an existing book, but from a handwritten copy of the first page, covered with a layer of washi, cut into jewellery blanks, and then edged & varnished as normal. 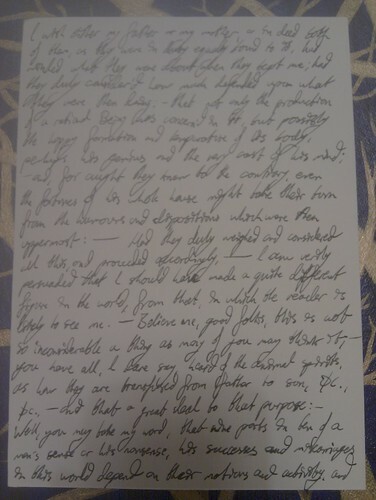 I love the combined effect of the fountain pen ink, the glue (just watery enough to affect the ink but not to smear it, it turns out) and the transparent paper. I’m definitely going to be doing more of these – the next text will be Frankenstein, or the Modern Prometheus, and after that I may start on some Wells or Verne. In the meantime, here’s a photo of the original text panel for comparison. I love the way that cutting it decontextualises so many of the phrases or words, highlighting a particular word or even a piece of punctuation. This is a very personal response to the play, almost the ultimate expression of the auteur principle possible without a proper theatre. I can choose to foreground some issues, place characters in their proper place, and generally take absurd liberties with the text—in other words, just what any director would do given complete freedom. At the same time, the form imposes some interesting constraints. I didn’t allow myself to add anything to it, and everything placed on the canvas (the backing material is a standard 40x40cm gallery canvas) had to be cut from flat paper. And because rules are there to be broken, the detailing on the rose is drawn by hand in ink. 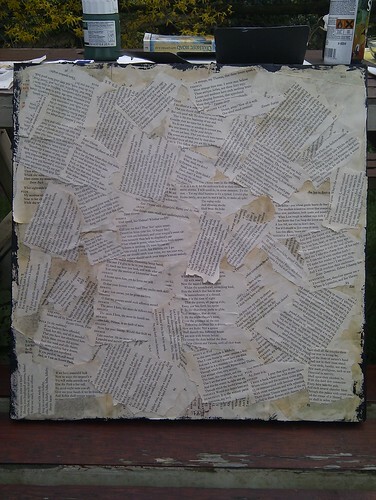 This is one of the first work-in-progress pictures I took, showing the final placement of text scraps without a frame. The sides of the canvas (30mm deep) I painted flat black, to evoke theatre flats, and the varnish on the face is deliberately matte—this play has had enough gloss put on it in the past without my adding any more! 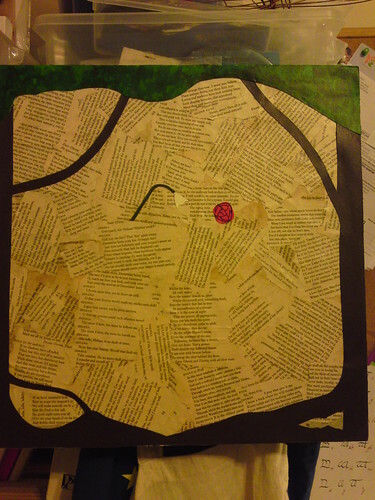 This is the first Shakespeare collage I’ve done, so I’m not sure which features of this one are going to be general and which are play-specific. Dream is an intensely theatrical play, and not only because of the play-within-a-play performed by the mechanicals. Admittedly, there’s a certain amount of that always present in theatre, because actors sicken, pine, and get grumpy if they don’t get the opportunity to play someone who can’t act every so often. Writing about it, I’m already thinking of three different versions I could do, but I’d rather work on another play first.